This wine is composed of the best Pinot Noir from 2014 and 2015. We had very small harvests from 2014 and 2015 due to frost damage in 2014 and hail damage in 2015. Both vintages produced exceptional quality fruit, so we blended the vintages together to make enough to bottle. This Pinot Noir is more fruit and barrel forward than our Arcturos Pinot Noir. Raspberry, cherry and plum flavors and aromas followed by elegant oak. With proper cellaring this wine will age well for five to ten years. This is a very versatile Pinot Noir that will pair nicely with a myriad of dishes. We recommend, roasted turkey, pheasant or duck, mushroom pizza and grilled tuna steaks. 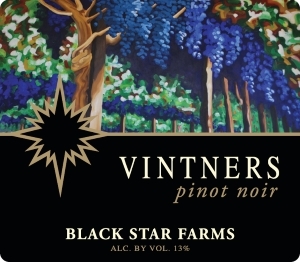 This bottling of Pinot Noir is one that remains more fruit forward than many we create. From Anonymous of Wyoming, Michigan on 5/8/2015 . This wine is a perfect red for a summer day. Smooth and velvety, not too heavy with a very subtle sweetness. Great with a gourmet meal or just a cheese pizza.